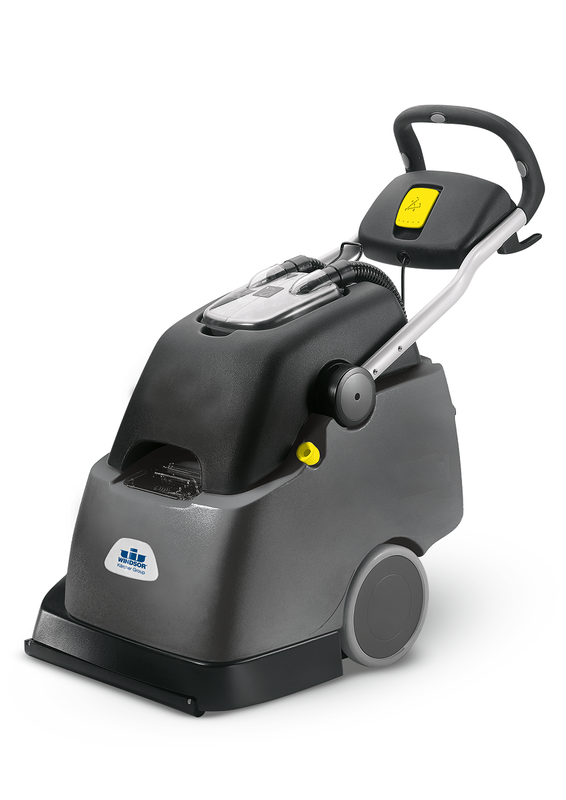 Windsor offers a full line of industry-leading commercial vacuums, extractors, scrubbers, floor machines and specialty cleaning machines designed to increase your cleaning productivity! Why should you choose Windsor as your partner for your entire floor cleaning program? Windsor is committed to excellence in three key areas important to mutual success: Product Innovation, Training Education, and Service Support. 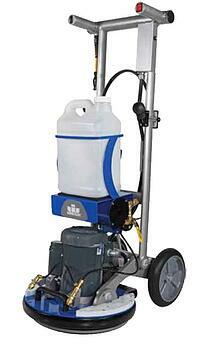 Windsor offers a complete line of commercial floor cleaning equipment. Their goal is simple—increase productivity while driving down the total cost to clean. Windsor cleaning equipment is designed to help you do just that. And, like their products, Windsor is virtually everywhere. Through a long-standing partnership with dealers and service support network, Windsor offers nationwide access to equipment service, planned maintenance and technical support. Windsor is ready to analyze your needs and offer the best cleaning solution for you. 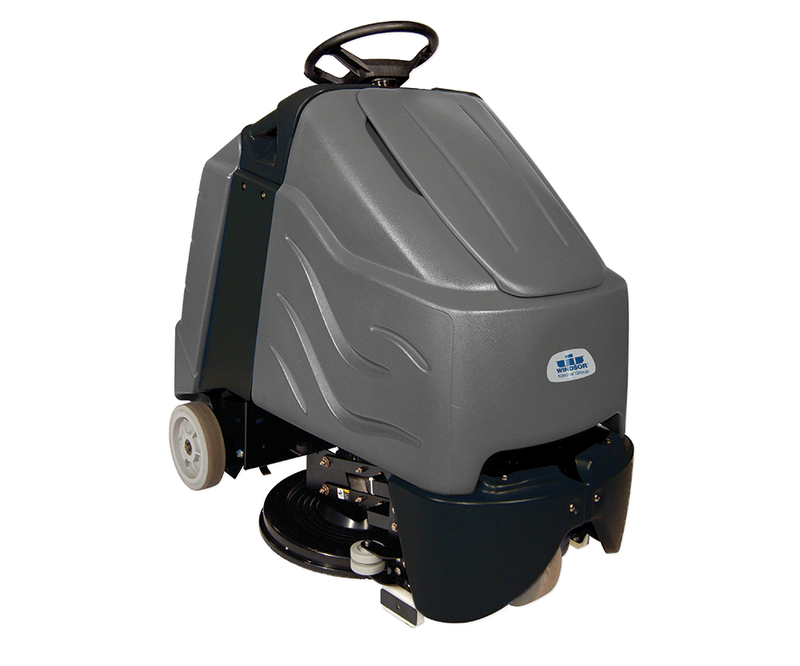 Windsor® Taz™ Deluxe Orbital Machine 17” Pad Driver has orb technology and is the only all-surface cleaning, scrubbing, sanding, polishing, extraction, interim and grinding machine in the industry. It conquers carpet, stone, tile & grout, wood, vinyl, concrete, epoxy, and other surfaces. The Taz excels at chemical-free stripping, interim carpet encapsulation and tile and grout cleaning. The Saber Glide Series were built to make the people who work with the machines more productive. It’s ergonomically designed operator compartment provides a commanding view of the work area and provides extra comfort. The compact, maneuverable design allows for easy driving through a standard 36" doorway. 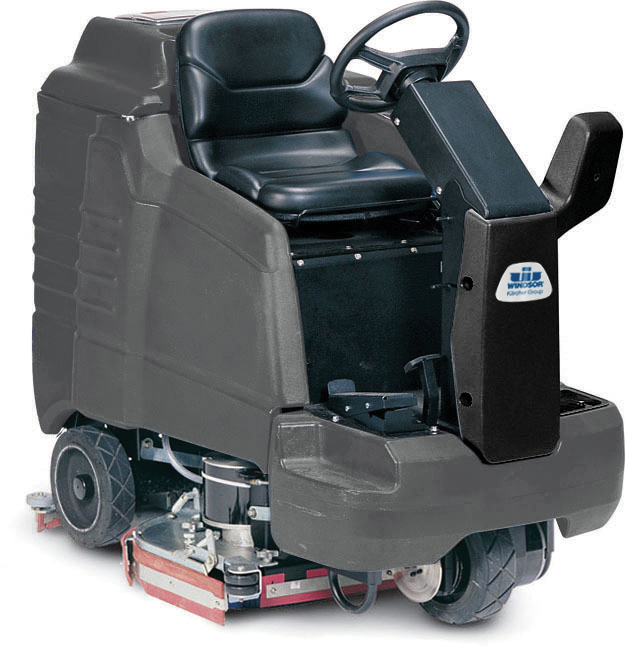 The small footprint provides a tight, 66" turning radius. The Saber Glide fits in a standard elevator. The simple, intuitive controls reduce operator training time. 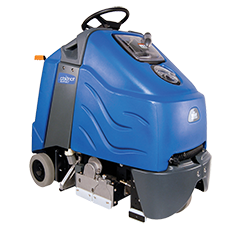 The compact design provides powerful scrubbing in congested areas. The Saber Blade has two counter-rotating brushes with variable cleaning pressure, up to 88 lbs. There are two squeegees for pick-up in forward or reverse. The large 2.5-gallon solution and recovery tanks are easy to fill, empty and clean. It has an easy to understand control system with ergonomic handle and no tool brush and squeegee removal for easy maintenance. 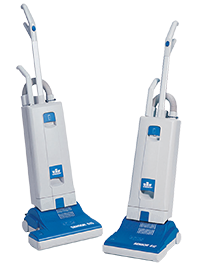 It has a cleaning pressure adjustment for effective cleaning on different floor types and there are a variety of brushes available for any cleaning application. Click here to view more of the 1500 series. Click here to view more of the 2000 series. Windsor’s Chariot iExtract is engineered for deep restorative extraction for carpets with heavy accumulation of soil and stains. Its high pressure, 100 psi pump, 1.2-GPM flow rate, and two 800-RPM counter-rotating cylindrical brushes sweep small debris into a debris bin and aggressively attack and remove soil and stains. It combines the innovative technology of the Chariot stand-up platform and Windsor’s 35 years of experience building superior, reliable carpet extractors. The Chariot family of cleaning equipment is the industry’s only stand-up platform. The Windsor Clipper DUO provides deep restorative and iCapsol encapsulating interim cleaning processes in one machine. With the Interim method using WAXIE-Green Encapsulating Carpet Spin Bonnet Shampoo (#070661), the carpet is dry and ready for traffic in about 20 minutes. The iCapsol Interim cleaning process extends the time before re-soiling occurs and reduces wicking. The Deep Restorative mode is activated by the simple change of a dial regulating the required detergent and water for deep down, fully restorative cleaning. The Windsor 34" Chariot iVacuum Deluxe Stand-On HEPA Commercial Vacuum is designed with Windsor’s Chariot Patented Stand-On Cleaning Technology* that significantly increases productivity and cleaning quality. The iVacuum Deluxe provides increased acoustical performance with the Muffle-Mizer – designed to produce a dBA of 69 or less. The Chariot iVacuum Deluxe includes a standard side broom. 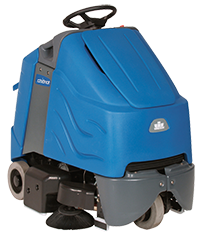 Its floating suspension system provides consistent brush contact over uneven surfaces for unmatched cleaning with no operator adjustment needed. 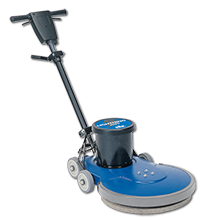 The unique brush system features two counter-rotating cylindrical brushes to effectively clean and agitate the carpet surface. 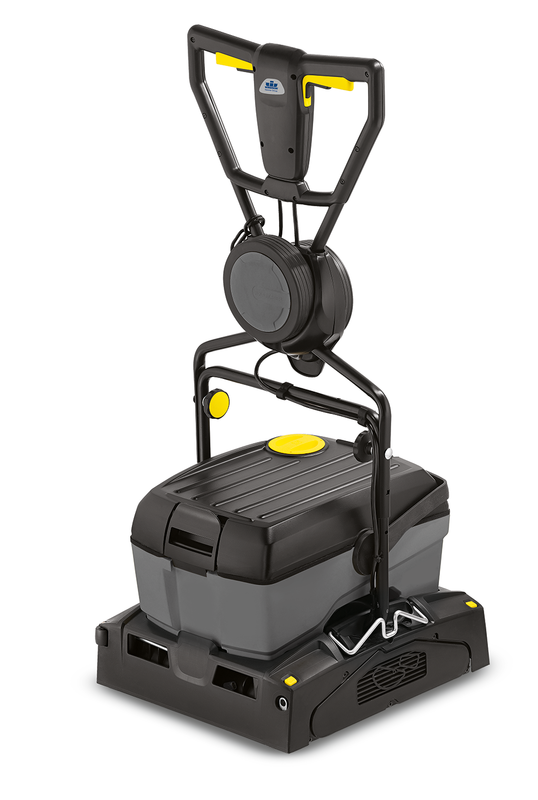 The Sensor S vacuums have a larger, 1200-watt vacuum motor that pulls even more dirt from the carpet. The high efficiency filtration traps 99.6% at 0.3 microns for improved indoor air quality. It has ultra-light handle weight that increases operator comfort and productivity. The onboard tools and extension wand make this vacuum the perfect detail cleaning machine. It has indicator lights for: vacuum bag full, clog, brush height and brush jam. The vacuum's low profile, flat-to-floor hinge design makes it easy to clean under beds and furniture. It has an easy-to-change vacuum filter bag. Click here to view more on the 12" series. Click here to view more on the 15" series. 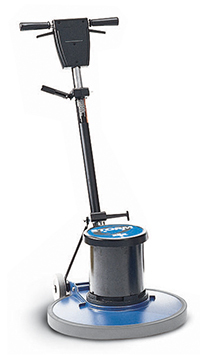 The Windsor Storm comes in a variety of sizes from 13" to 20" with a 1-HP motor or 1.5-HP motor on certain models. Easy-to-use fully adjustable handle height system with easy cord release. Large 5" non-marking wheels for easy transport. The built in mechanical safety interlock to prevent accidental start-ups. Built in circuit breaker to protect motor. It has a rugged cast aluminum base and switch housing with non-marking bumper to protect the machine and facility. Heavy duty steel triple planetary gearbox for smoother operation and longer life. High torque, 66 frame induction motor for trouble free operation. Dual capacitor for high efficiency operation. Additional features include a high mounted handle lock/height adjustment, heavy duty construction, non-marking PVC bumper, dual main switch levers and thumb activated safety interlock. Click here to see more info on the 13" 1.5-HP series. Click here to see more info on the 17" 1.5-HP series. Click here to see more info on the 20" 1.5-HP series. Click here to see more info on the 20" 1.75-HP series.